Intel's latest Classmate: Who needs an iPad? Intel launched the latest generation Intel Convertible Classmate PC this morning in Central Park, with a group of 5th-graders touring the Central Park Zoo, Classmates in tow. I'll post video content from the day as Intel uploads it, but for now I wanted to provide a thorough review of the new device. Intel launched the latest generation Intel Convertible Classmate PC this morning in Central Park, with a group of 5th-graders touring the Central Park Zoo, Classmates in tow. I'll post video content from the day as Intel uploads it, but for now I wanted to provide a thorough review of the new device. I've been putting one through its paces since late last week and also had a chance to talk with Intel representatives about new features and improvements, some of which are evolutionary, and others of which are quite significant. I've been a fan of the Convertible Classmate since its launch. After all, what's not to like about an inexpensive tablet/netbook combination with an educational software stack, plenty of hardware and software partners, and ruggedized features? I was such a big fan, in fact, that I rolled them out in two of the elementary schools in my district. While the Classmates were initially a big hit, we ended up running into some reliability issues, particularly at one school where the computers were being treated quite poorly. Although some easy hardware fixes, some professional development for the teachers, and training for the students largely addressed the problems we were having, I was still a bit concerned. These machines weren't as cheap as completely disposable netbooks and were designed for much harsher conditions than rural Massachusetts should be able to dish out. Then one of the new Classmates arrived last week and every one of my concerns went away. Although slightly heavier, the new convertible tablets are improved on several fronts, taking a relatively tough, kid-friendly computer and turning it into a rugged iPad killer with a keyboard and software stack suitable for a variety of use cases all the way from Kindergarten through 12th grade. The keyboard, in addition to being larger and easier for touch typing, can now also be ordered with antimicrobial plastic. The keys, which some unruly students managed to pop off previous generation Classmates, are now closer together and feel significantly more secure. My one major complaint? How many function keys do you really need? The right-hand Fn key, shown here, means that the right shift key is tiny and often, instead of capitalizing a letter, you move to the previous line. Probably not a huge deal for tiny hands and slow typists, but for a guy with relatively small hands who types pretty quickly, it's a pain. Overall, though, the size of the device lends itself to a larger cross-section of users. 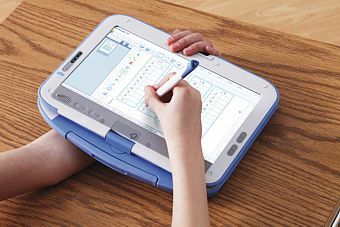 I wouldn't hesitate to recommend the new Classmate to an older student and would certainly consider the little computers for 1:1 applications at all levels of K-12. Their increased durability, size, and HD-capable video performance make them great tools to have at the ready in any classroom situation. The 8.5 hours of battery life, by the way, is a realistic number, making it well-suited to an entire day in and out of backbacks or moving from room to room on a cart. I've gotten almost 8 hours continuously broadcasting on my "ChickenCam," sharing my agricultural adventures without AC power and with anyone who cares to watch 12 chicks sleep on top of each other for several hours at a time. In addition to improved hardware, the availability of Windows 7 makes a real difference in the performance of the new Classmates. Boot up is quick, applications are generally snappy, and multitasking is certainly tolerable. Windows 7 also has native support for touch, making the tablet interface even more appealing. So is this actually an iPad killer as I called it above? Watch the brief video review below to find out why I think most educational settings can benefit from one of these new Classmates at least as much, if not considerably more, than an iPad. So, do we have an iPad killer on our hands? At least in education, the Classmate's competitive price (final pricing hasn't been released yet, but should be comparable to the $499 of the previous generation), physical keyboard, full-blown OS (as opposed to a phone OS that relies on Apps), a touch screen/stylus combination that feels remarkably like writing on paper, built-in webcam, and expandable components all make the iPad hard to justify. There are plenty of use cases to which the iPad is well suited, even in schools. However, my money is on the new and drastically improved Classmates for most situations.